Cream pies are a food fight favorite. A food fight party is a wild, creative option for a child's birthday party, a summer celebration, or just to burn off energy in a slightly structured way. A food fight doesn't have to mean tossing an unwanted piece of lunch or a leftover bite of dinner at someone across the dining room. There are many ways to structure a food fight that make it more than just a free-for-all. The most structured type of food fight is one that is used as a reward for a contest. 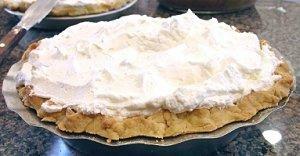 Children could compete in a variety of party games, but instead of the cliché plastic prizes, they win the opportunity to toss a cream pie at another party member, a parent, or a chaperone. The contest could also be structured as a competition between teams, with the losers surrendering to a tasty barrage. Mock battles are another form of food fight. Participants are divided into teams with the goal of demolishing their competitors. The battle could be waged in several waves - a water fight followed by a flour fight for example - or it could be one massive confrontation. Recreating a Civil War battle, using squirt guns filled with juice, soda, or syrup, or adding targets and definitive goals make this a more structured event. Water balloons can be filled with more than just water, and a food fight party could use these crazy bombs instead of open containers of food. For added suspense, balloons could be filled with different substances: chocolate sauce, juice, whipped cream, soda, cold soup, or gelatin. Adding some plain water balloons into the mix will help keep some of the fun cleaner and make the messy balloons all the more spectacular. The most popular type of food fight is the idea of barely controlled chaos. For these fun events, guests simply take aim and let fly on any moving object and everyone is out for themselves. Food could be provided in identical portions to each participant, or children could be allowed to choose from a delightfully messy buffet of food fight favorites to toss at their adversaries. Baked beans can be good food bombs. For safety, all foods used should be soft - eggs may seem to be the perfect food fight dish but the sharp shards of a broken shell can turn a fun event into an unhappy accident. Despite the fact that the fight menu isn't intended to be eaten, it should be chosen with consideration for guests' allergies and potential spoilage - avoid mayonnaise-based products and other items that could sour quickly. Before the party begins, all guests (and their parents) should be informed about the nature of the event, and clear behavior guidelines should be established to keep everyone safe and comfortable with the impending battle. The prospect of a food fight party may make parents cringe - after all, the adage "don't play with your food" has been a dinner table motto for generations. Yet the cleanup for this fun fight doesn't need to be a chore. To keep the guests clean, they should wear old clothes and sturdy shoes - sandals and bare feet are not recommended because the food can make the ground slippery and dangerous. Party hosts should have rain ponchos (large trash bags work well), spare, oversized clothes, and other cover-ups available as well. To keep the party area clean (as impossible as it may sound), an outdoor location is best. A tarp or other ground cover could be laid down, or if the party is in an out-of-the-way location, the leftover food may be taken care of naturally. If the party is indoors, sheet plastic can be tacked over walls and carpeting for quick and easy cleanup. Vinyl tablecloths and disposable plates and cups are also easy options. After the party, guests should help clean up the battlefield as much as possible, particularly in a public area. While it will be impossible to pick up every crumb, children who are already covered with goo won't mind picking it up from the ground. Having them clean up also teaches a valuable lesson about using public spaces properly and why an indoor food fight is a bad idea. If necessary, hoses may be needed to rinse away the last party remnants, particularly from tables or benches. If the idea of a food fight is just too messy to contemplate, there are other alternatives that have similar chaotic fun without as many wasted calories. Silly string fights are a fun option, or kids will love a summer water fight. Older children or teenagers may even enjoy an organized paintball war. The occasional food fight might be dreaded by parents, but an organized food fight party can be a memorable and exciting event for children. With proper preparation and cleanup, even the messiest event can be easily tamed and enjoyed by everyone.